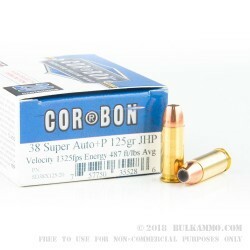 This 38 Super +P cartridge by Corbon sports a 125 grain jacketed hollow point projectile. The jacket is specially scored inside and out to ensure uniform and rapid expansion, so it and the lead core it covers will peel all the way back to their base within a soft target. 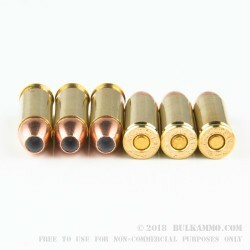 This cartridge offers a positively zippy muzzle velocity of 1,325 fps, which is enough to reliably cause its projectile to penetrate clothing without letting the fabric hamper its bullet’s mushrooming capability. The power in this round means it will penetrate 9” to 15” within a target, but with a significantly reduced risk of overpenetration. All in all, you’d be hard pressed to find a better self-defense round. 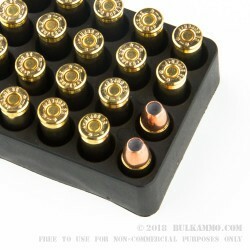 Please note that this is +P ammunition, and that you should under no circumstance load it into a firearm that isn’t rated for it -- unless you know someone who can open your ketchup bottles for you afterward. 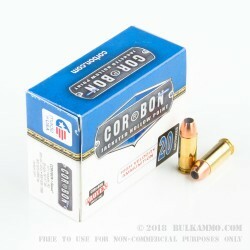 Corbon takes painstaking measures to produce their ammunition only according to their tried and true operating procedures. As the result, they only offer ammunition that they can proudly guarantee the performance of 100 percent.